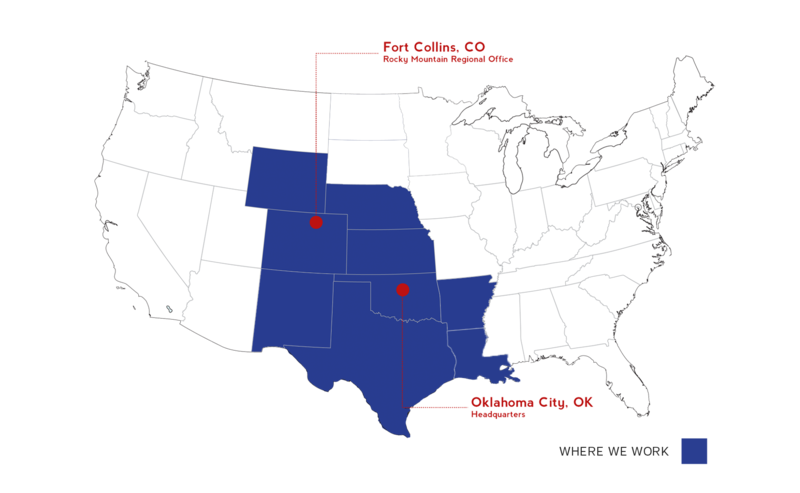 American Mineral Partners is a non-op mineral and royalty acquisition, management, and divestiture group based in Oklahoma City, Oklahoma. We have quickly become one of the leading purchasers of mineral interests in key unconventional oil and gas plays focusing primarily in the state of Oklahoma, while continuing to build our presence in Texas, Kansas, Colorado, Wyoming, New Mexico, Arkansas, and Louisiana. American Mineral Partners evaluates mineral property, giving mineral owners a chance to understand their rights and explore their financial options. Instead of waiting years to receive their royalty income through monthly or annual royalty checks, American Mineral Partners uses the latest technology and information to provide mineral owners with a very competitive lump sum cash offer for their mineral interests. By combining years of oil and gas industry knowledge, our team members will guide you through the mineral rights selling process. Our experience along with our thorough but quick evaluation process allows us to offer you a fair and competitive value for your mineral and royalty interests. We are dedicated to making every transaction simple and transparent. We pride ourselves on doing business the right way, the honest way, the American way. You could be entitled to thousands of dollars for the ground below your feet. We offer an attractive lump sum offer with quick payment, good service and complete discretion. We pay for all of the necessary documentation and filing fees. We’ll send you all the documentation you need. and you’ll receive fast payment! Mineral rights (otherwise known as a “mineral estate” are the legal rights that a person has to exploit, mine, or produce any materials underneath the surface of the earth. These materials may be any organic or inorganic substance such as ores of metal, coal, oil, natural gas, gemstones, stone, salt, or any other substance besides sand, gravel, or water. The owner of the mineral rights can sell, lease, gift, or bequeath these minerals to any individual or entity they choose. For example, a person may own 20 acres of land, and beneath the surface of that land lies minerals that can be sold or leased or gifted for an amount of money. That person may own the surface of the land, while someone else may own what is beneath the surface; in other words, the mineral rights. Surface rights differ from mineral rights in that the term “surface” refers to any organic or inorganic substance that lies on top of the surface, such as water, gravel, etc. If an owner wants to keep possession and control of the surface, these are known as surface rights, and these are different from mineral rights which lie beneath the surface. For example, a farmer can choose to sell the mineral rights to the coal beneath his property, but keep the surface rights which would allow the farmer to keep control of the buildings, the water, and anything else on “top” of the ground (surface). What is a DOI (Division of Interest)? A DOI (Division of Interest) is the term applied to how minerals are divided between the mineral rights lessee, which is usually the oil and gas company, and the lessor, who is usually the owner of the minerals. The lessee is the one leasing or buying the minerals, and the lessor is the owner or “client” from whom the company buys or leases those minerals. The Division of Interest is the contract between those two groups. For example, if a company wants to lease your minerals, you and that company must come to an agreement on how much royalties will be paid and how much minerals you will let that company lease/buy. These agreements usually include conversations about: how long the lease will be (this is known as the “term” of the lease), whether or not the lessor will receive a bonus upon signing of the contract, the royalty rate (which is how much the rates are divided and calculated), and on whether or not payments will be made even in a well that is not producing (this is known as a shut-in royalty agreement). These are just a few basic items that a lessor and a lessee may negotiate, but there are many more items that can be included, depending on the situation. What is the difference between leasing and selling of mineral rights? The main difference between the leasing and selling of mineral rights is the payment method for those rights which are: a lump sum of money at the beginning, or in payments of that sum over time. If you want to sell your minerals to a company, you will get a larger sum of money up front, but you will not receive any more money after that lump sum has been given. With leasing, you will receive a smaller payment up front, but you will also receive royalty checks over the course of the agreed upon time period of the lease once the minerals are harvested and sold. Should I lease my mineral rights? That decision depends on your preferences, but some factors to consider are that with leasing, the market price for those minerals may fall over time, and you may lose money in the long run. On the other hand, the price could rise over time, and your lease could produce more money. Another risk to consider is what happens when there are less minerals than expected, and the royalties stop sooner than planned; this can result in fewer royalties. Why do people sell their mineral rights? Immediate Cash: Some owners decide to sell mineral rights because they’d rather have a large up-front payment now than have to wait for years to collect an equivalent amount in royalty or bonus payments. They use the money to pay down mortgages, high-interest credit card balances, medical bills and other expenses. Others decide to sell their mineral rights and invest the money in “non-depleting” assets such as real estate or stocks and bonds. Still others decide to “cash out” so they can take that special vacation or travel the world now, rather than later. Paperwork Reduction: Some owners, especially those with smaller interests, decide that their mineral rights just don’t justify the hassle of ownership any longer. They would rather spend their free time doing something other than managing mineral interests that may not be making them much money. Eliminating the paperwork associated with mineral ownership can also significantly simplify your tax returns each year. Tax Considerations: When you sell oil and gas assets that you’ve owned for more than a year, the long-term capital gain proceeds you receive are taxed at rates no higher than 20% (as of 2013), whereas bonus and royalty income is always taxed at regular income tax rates, which can be as high as 39% if you’re in a high tax bracket. Please check with your tax or investment professional for questions related to tax or investment advice. The information provided on this web site, while believed to be accurate, is not meant to be tax or investment advice. Oil and Gas Interests are “Depleting Assets”: No matter how good a producing well is, it will eventually stop producing as the field it’s in becomes depleted. Once that happens the mineral rights will be virtually worthless. Since it’s hard to predict exactly when a well or field may become depleted, many people decide at some point to convert some or all of their mineral properties into other assets such as real estate, stocks, bonds and other investments that may hold their value longer, or may appreciate more than their dwindling oil and gas interests. Estate Management: Often it is easier to liquidate mineral rights held by an individual while they are still alive, rather than waiting until after their death. If the individual owns mineral rights in more than one state their estate would need to be probated in each of them in order for title to pass to their heirs in most cases. In addition, if the individual resides in one state at the time of their death, but owns minerals in another, their estate would also need to be probated in the state where the minerals are located in order for title to pass to their heirs. This can result in a lot of expense for an estate, and thus the heirs. It is much easier to distribute cash assets to heirs than it is to divide up property after someone passes away. Many individuals decide to sell for this reason, especially those with smaller interests. “Fractionalization”: As mineral rights are passed from one generation to the next they are often divided into such small amounts that their economic value to each succeeding generation diminishes exponentially. Keeping track of the minerals at that point can become more of a headache than they are worth to the heirs. This is often referred to as the “fractionalization problem” and is one reason many owners end up selling their mineral rights while they are still alive rather than letting them be split into smaller and smaller pieces with each passing generation. Owning mineral rights is somewhat of a gamble most of the time: Some mineral rights owners for various and sometimes merely sentimental reasons decide not to sell their mineral rights under any circumstances; and it is certainly possible that keeping them will produce more income over the long run than selling them would; however it is somewhat of a gamble to count on that as a sure thing. Why do my royalty checks vary each month? Each royalty check is based on the production of the well along with the current price of oil or gas. As production and prices fluctuate, so will your monthly royalty check. Operators Reputation – Every operator is different. To ensure you get the most from your interest, make sure to use a reputable operator. Interest Type – The type of interest, whether royalty, overriding royalty, mineral rights/interest, non-participating royalty interest, or working interest will factor into determining the value. Tax Rates – Tax Rates for purchase and severance may be too high, low, or non-existent pending your state of where the interest is located, which affects a property’s value and offer rate. Geographic Location and Basins – Some geographic locations and basins are preferred to others (For Example: The Permian Basin would score higher than the Gulf Coast Basin, which is known for potential water issues). Will selling my mineral rights affect the surface of my property? No, selling your mineral rights will have no impact on the surface of your property. What kind of interests are there? All oil and gas interests share in the revenues from producing oil and gas wells. Often you will find the terms “mineral interests” and “royalty interests” are used interchangeably. However, there are important differences between these interest types. - A mineral interest owner is the person or group of persons who owns the mineral rights to the minerals being produced. These owners share in the revenue from producing oil and gas wells but do not pay for drilling expenses or ongoing operational expenses associated with well production. There can be many mineral owners in a producing well, each with a different percentage of the producing well’s revenues. Generally, mineral interest ownership ranges from 12.5% to 25% of the net income produced. - As previously noted, because of their similarities the terms for mineral interests and royalty interests (RI) are often used interchangeably. However, in some cases, a royalty interest could also be defined as a non-participating royalty interest (NPRI). This means that the owner does not own the actual mineral rights in, on, or under the ground. Rather, the NPRI owner is entitled only to a revenue interest of the oil and gas produced or stored and sold. Consequently, NPRI owners do not have the right to negotiate or execute a lease or receive “paid up front” lease bonuses or rental payments. They are bound to the lease terms executed by the actual mineral rights owner. An NPRI interest is created when a mineral owner chooses to sell the income they are receiving from a property to an investor without selling their mineral rights. - These are interests similar to NPRI’s but are typically not bound to minerals or mineral rights assigned by a mineral owner. Instead, these interests are bound to a specific well or lease and establish ownership only of a portion of the revenues generated from oil and gas production. For this reason, when a specific well or lease expires due to cessation of production, the ORRI expires. - The working interest owner is the person, group of persons or company who owns the right to extract the minerals under the surface via a lease with the mineral owner. It is not uncommon to have multiple WI owners in a well, but in almost all cases, the largest working interest owner is the operator. Working Interest owners are obligated to pay a proportionate share of all costs associated with leasing, drilling, producing and operating a well. After royalties are paid, the WI owners share in the production revenues based upon the percentage of the working interest owned. Should I just hold on to my mineral rights?